Crafting with Suzanne (& Jess): "Do You Want to Build a Snowman..."
"Do You Want to Build a Snowman..."
It's July. The summer holidays have just begun. It's hot and sticky outside but your three and a half year old is being Elsa. She has used her power to make the snow and ice for you both to play in but that is not enough, she has got to build a snowman. So, what do you do? 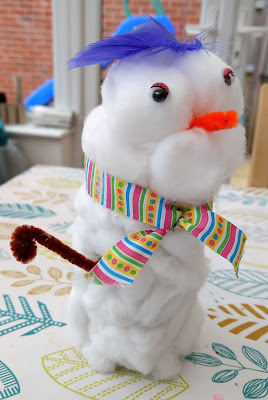 You raid one of your craft boxes for cotton wool, ribbon, pipe-cleaners, a feather and googly eyes, find a toilet roll tube and some glue and you help her make a snowman of course. What else could you do? !